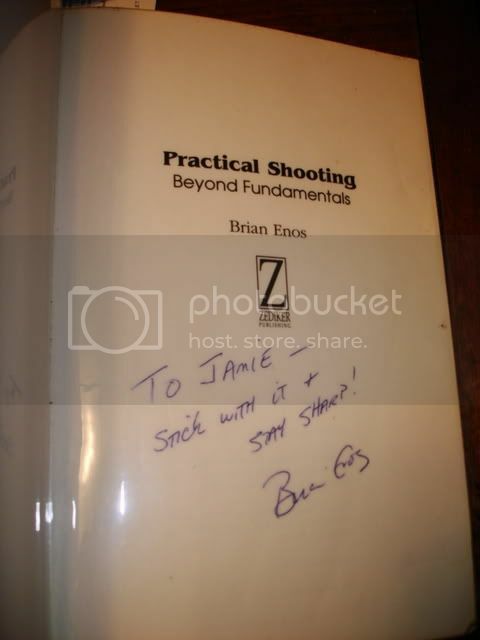 Practical Shooting, Beyond Fundamentals, on Ebook - BrianEnos.com / BLEMS IN STOCK - Brian Enos's Forums... Maku mozo! Brian will your book be available on Kindle in the future? Exciting news! Practical Shooting, Beyond Fundamentals is now available on Kindle. 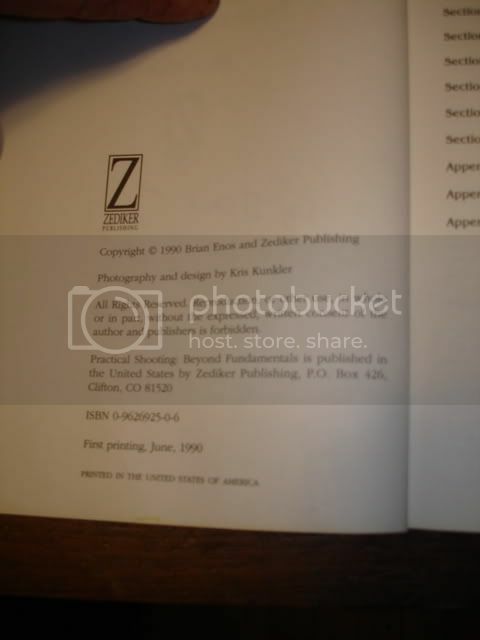 .pdf is apparently not a good starting point for conversion to kindle. I suspect that the printers who print your book have it in one of the other formats required for conversion. Unfortunately the only file the book can be printed from is the old-school "flats." For the last printing, they tried to convert to PDF to print from, but the quality of the proofs was absolutely horrible, so they printed from the flats. I saved the PDF as a DOC file, but the formatting didn't translate that well to the DOC file. Anything that's not just basic formatted text will have to be manually edited, and in areas were the formatting didn't translate, the save as also created typo's. Big loser. So I'm not sure if it would be worth it to manually edit the entire book, to get it on Kindle. I certainly don't have the time for it now anyway. I searched all the online bookstores hoping it was available online. I wanted to buy it to read on my ipad. I ended up buying the book and read it straight through in two days. Thank you Brian for all the well written info. After shooting a horrible match 3 weeks ago, I bought your book and went back to ground zero. I followed your advice to the letter and practiced the drills focusing on the goal of each drill. I have made so much progress in the short time I've been doing them. Thank you! worth every penny. +1 on the book Brian. The hardest distance in shooting is....the six inches between the ears...... and your book makes that clear. I think you'd need to reformat the whole thing anyway to take into account the differences between a DOC and ePub format... If I get fired next year (a distinct possibility) then I may find myself with some time on my hands... if so, I wouldn't mind taking a crack at it. I recently converted several PDFs to my Kindle using "calibre". While some formatting was lost, especially the NEW-PAGE between chapters, the content was easily readable. Part of the issue is that we're still in the format wars. Just like VHS and Betamax, Kindle and epub are both good but non-compatible. I have a Nook that uses epub and pdfs, but the Kindle is priced below cost and ebooks are cheaper on Amazon than Barnes and Noble. The deciding factor, I think, will be individuals; if enough folks start publishing to one format or another and skip paper totally then we'll have a winner. Until then the jury is open. I have a guy working on a Kindle version right now. He's starting from scratch, and is 100% confident the Kindle version will be fully functional. Not sure - I'll post here when I know. From my reading it should be possible to write a script to translate flat files to xml. From there the world is your oyster. Glad you have it moving forward! Kindle format means iPads + Android tablets are good to go too! I'm down for a copy. Nice! I have been looking for a Kindle copy of the book. I bought a paper copy, but will have a Kindle one as well as soon as it is available. "Exciting news! Practical Shooting, Beyond Fundamentals is not available on Kindle." I thought it was sarcastic reply, but now see it's a typo! Kinda clueless with the ebook thing. The wife does all the ipad stuff. She has a kindle app on her Ipad. Can I get the Kindle version through the Kindle app or do I need to own a kindle for now? It was unchallenged for a long time! I just went out a bought a copy and downloaded to my Kindle, even though I still have my ancient much-marked-up paper copy.